I'm a little bit in love with my new dishes. 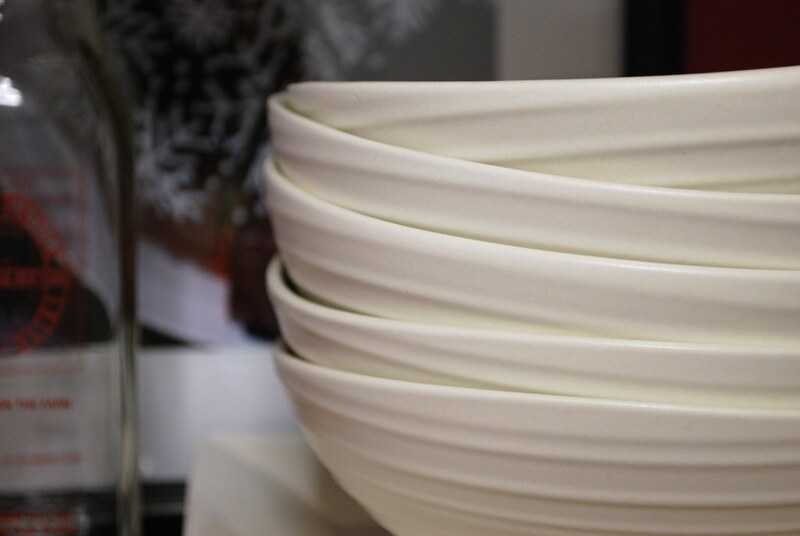 Whirly white and purposely unglazed on the outside, they're a dream to hold. I found the first plate on the clearance rack at Bed, Bath & Beyond for 3 dollars, and brought it home to use as a photo prop. 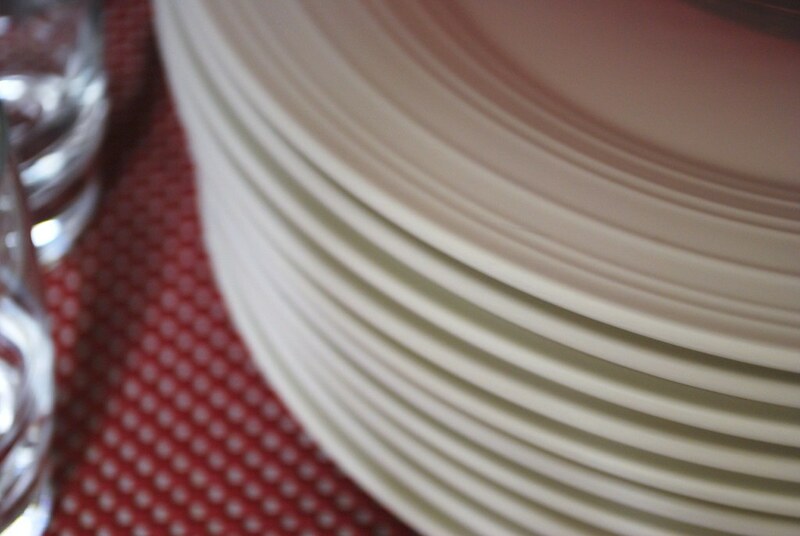 For weeks I kept this one plate stacked on top of all my others, instinctively pulling it out whenever I was serving myself. The stacks and stacks of hand-painted brown plates I'd owned for ages went (mostly) undisturbed while I washed and rewashed my favorite plate. And then on my birthday, I realized what I had to do. I turned my cherished plate over and I looked up the pattern (Mikasa "Swirl White"). The results popped up quickly and I was a little bit horrified to find that it was a much pricier set than I'd expected. After a few days of searching for the best deal, I fell upon a delicious sale that would cut the price of the plates down to about half. Still spendy, but I pounced and ordered myself a service for eight. They arrived at my office a few days ago in eight matching navy blue boxes that Eugene helped me carry home Saturday morning. 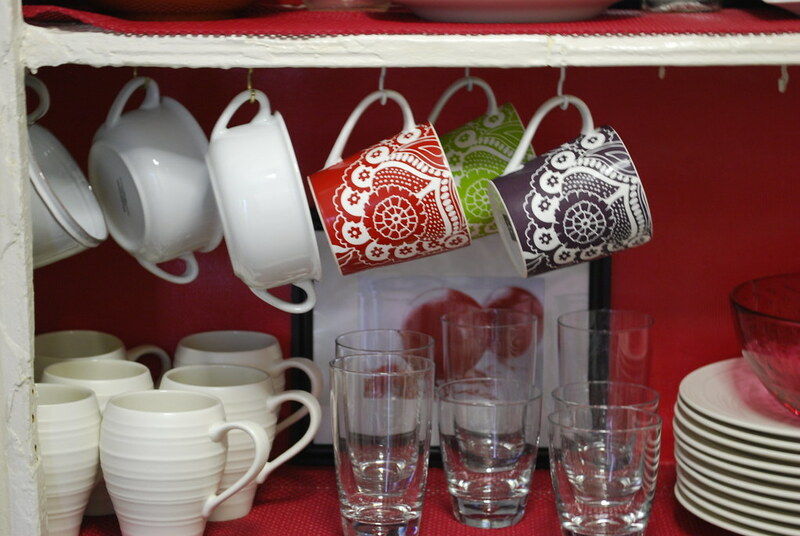 The afternoon was spent arranging the new plates and mugs and sweet little whirly bowls in my newly-lined red cabinets. Because, why can't kitchen cabinets be pretty? For years I was bored with the old bumpy white cabinets that had been painted and repainted in a dingy shade of blah. So I hunted around, and found some gorgeous faux-lizard skin paper in a brilliant glossy shade of red at only 5 dollars a sheet. I brought this home and cut it down to size, then affixed it to the backs of the cabinets using Elmer's spray adhesive and a credit card. Back at Bed Bath, I found a matching red grip liner paper to cover the bottoms of the cabinets and provide a protective soft cushion for my plates and glasses. A few more snips with my scissor and the cabinet was suddenly pretty as a schoolgirl in a frilly red dress. 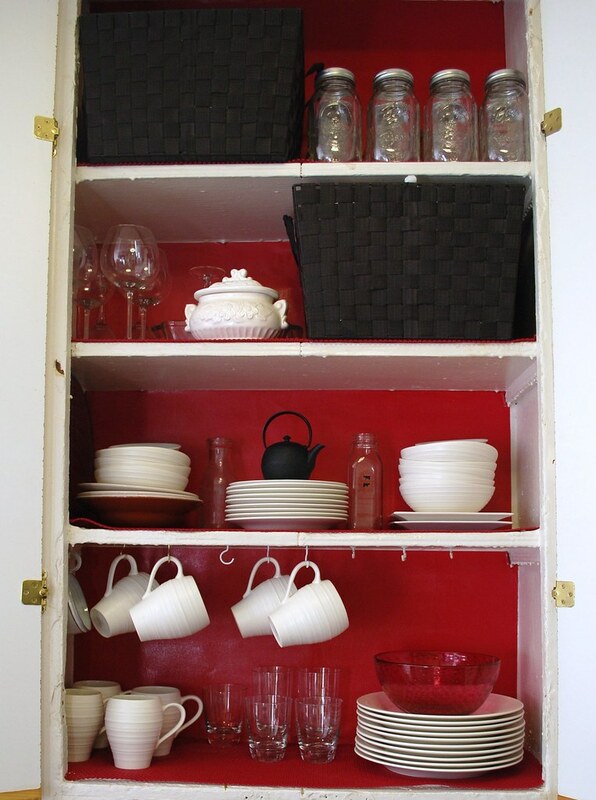 My ultimate plan is to remove the cabinet doors so that the pretty red is permanently on display. Of course, open kitchen cabinets call for a bit of editing so I pulled out all my old dishes and mugs (I'm planning to either sell or donate to Housing Works), along with a few random plates and cups that I no longer want. I bought two large woven totes in a lovely shade of espresso, and filled them with all the ramekins, jars, mini casserole dishes and small appliances that were cluttering up the cabinets. I placed one of these on each of the top two shelves, and then rearranged the remaining glasses and dishes from top to bottom in order of use (with the most-used plates and mugs at eye level, and the less used wine glasses, soup tureens, and canning jars up at step-stool height). I recently had a bunch of prints made from some of my favorite food photographs (available for sale here, if you'd like to buy your own!) and decided to tuck a few of these in the cabinet behind the plates. I'd never thought to hang pictures inside my cabinets before, but once I did it, I was absolutely smitten and ran around the apartment trying to see where else I could hang a couple pictures. My love affair with these new mugs has left me looking for excuses to use them, and so I thought I'd share my new favorite excuse with you: a hot vanilla ginger infusion. To make it, simply simmer about two inches of sliced fresh ginger, a half vanilla bean, and a few cardamom pods in 3 cups of water for a half hour. (You can add cinnamon sticks or orange peel or star anise to the ginger, if you prefer.) I then turn off the heat and let it cool to room temperature for about 15 minutes (you can let it go longer too; that's just the minimum so I can get a nice steep going). 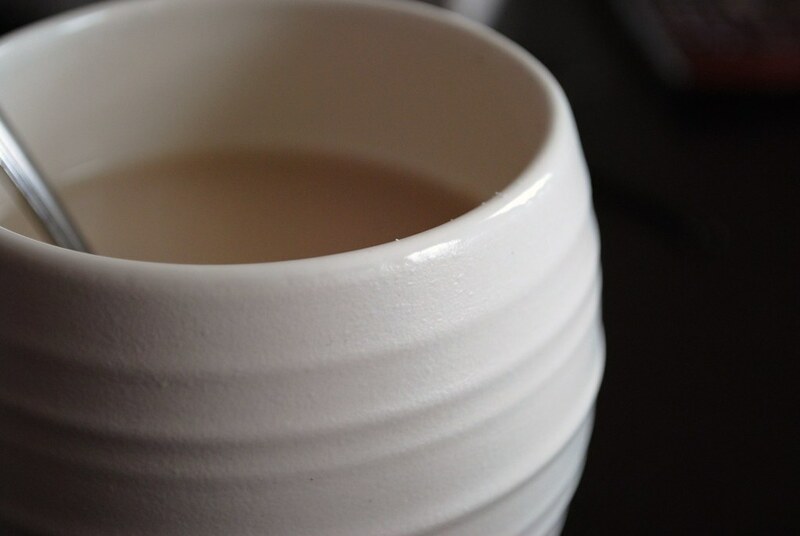 When I am ready to drink, I heat it up to a boil again quickly before straining and pouring into a mug. I sweeten it with a bit of sugar or honey or--if I'm feeling virtuous--Splenda, and then I add a splash of cream. The end result is spicy and soothing; perfect if you have a cold (or are simply trying to warm up during one of these frigid afternoons.) I tend to stay away from caffeinated tea, but if you're a fan, I bet this would also be a lovely with a bag of English Breakfast added to the cup. One tiny warning: this tea absolutely SCREAMS for a piece of cake. 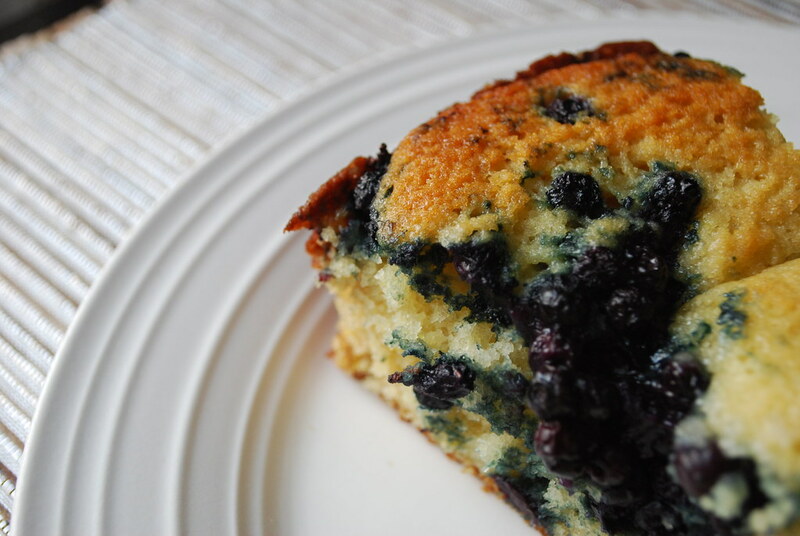 I didn't have any on hand yesterday, and so despite the fact that we were heading out for Valentine's Day dinner in just two hours, I soon found myself whipping up a lazy-easy blueberry buttermilk cake (using one bowl, one measuring cup, and more handfuls than called for of winter-friendly frozen wild blueberries). I pulled the cake out of the oven and was finishing my last bite of my first piece (I didn't even let it cool before cutting it! 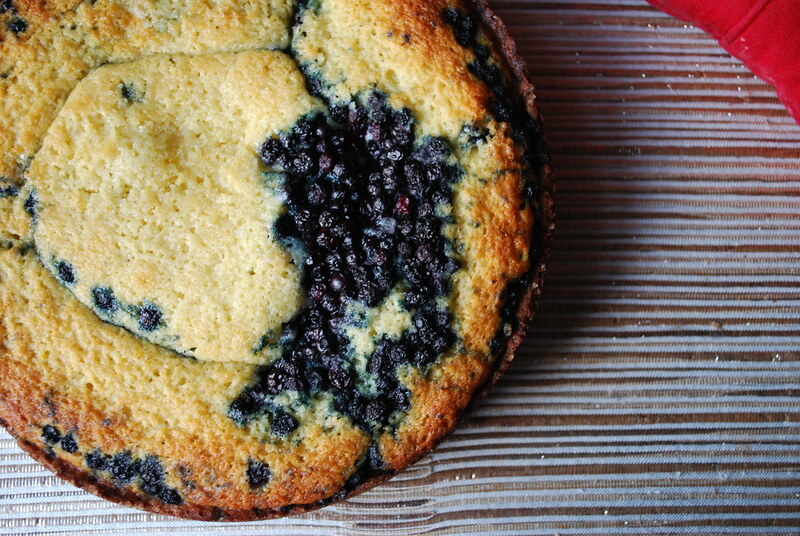 ), before I realized this was the official first cake to be served on the new plate. Quite a nice start, I'd say. That is the most insanely beautiful cake I have seen in a long time. It is perfect! Love the cabinets - and the cake! The cabinets look GREAT! That was a fantastic idea to store all the more clutter-y things in the woven totes. It looks adorable, organized, clean and fantastic. Love the idea of open cabinets. Can't wait to try that infusion! Mmmm. And I love your mugs! Gorgeous!! I love your cupboards!! I love your new dishes and cupboards! I have 2 cats, so that would prevent me from ever being able to do the no doors thing, their fur gets everywhere! I can't decide which looks the best, your beautiful cabinet or that yummy looking cake. (Oh, and I can definitely see why these dishes were a *must have* for you.) Fab! 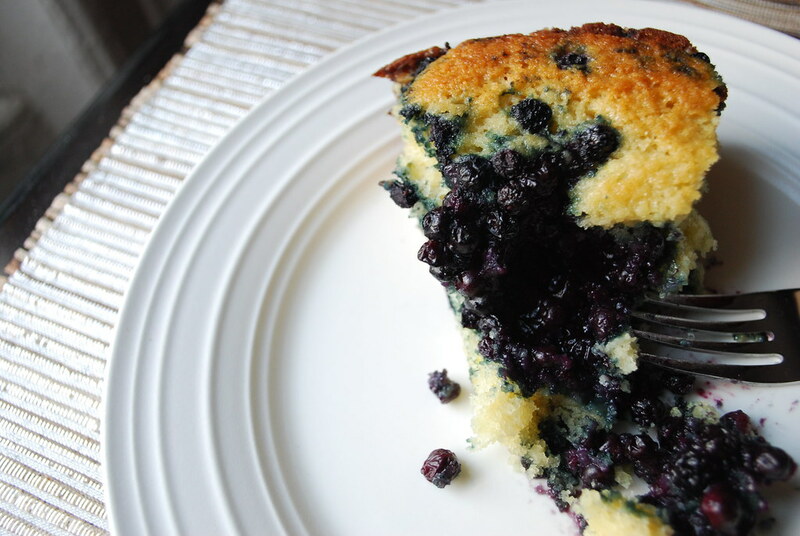 I love how the blueberries just spill out of the cake! I love the new dishes! The red is quite pretty too :) Oh and the cake of course, looks delicious! Beautiful!I love it!I would probably admire my cabinet the whole day if it was as pretty as that! Congratulations on your engagement...and I know what you mean about coming back from vacation. We just spent 10 days at Disney World w/ out 3 girls...had a blast!! Now we are hoping to return in May for our 13 yr anniversary (w/out kids this time) and roam the countries of Epcot...tasting, tasting...and reveling in ALONE time! !